We would like to thank Amy Landino so much for joining us all the way from Columbus! Her time in Raleigh was spent so well because it was with us! First, do you even know Amy? Check out our live interview with her on our Facebook page. Amy began her presentation telling her story of being “the last bridesmaid”. A few years ago, she was asked very last to take the place of a bridesmaid not able to attend a wedding. She absolutely would but even though she was “the last bridesmaid,” she was determined to be “the best bridesmaid.” This is where her passion for video and video storytelling began. She shot her first film as a gift to the bride. She went to her hometown to find the people her and the bride had grown up with, this way everyone who couldn’t attend the wedding could wish the bride and groom the best. Amy fell in love with the feeling the video brought out in the viewers when she showed the homemade video to the wedding attendees, and so a vlog boss was born. Amy quickly moved on from her story to get down to business and share how she has this vlogging thing down to a science. 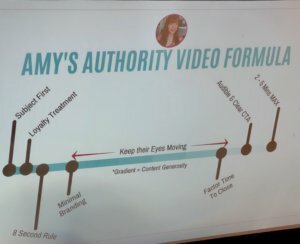 “1/3 of online activity is spent watching the video,” “50% of viewing activity is mobile,” and “81% of people are convinced to buy because of a video.” She then broke down the percentages of types of content she calls “hub, hero, and help.” Hub content, as Amy describes, is your brand’s regular push content. It’s what you have centered your brand around and what your audience expects, for the most part. Hub content is produced 60% of the time. She also described hero content, produced 10% of the time. Hero content is trends, timely topics, or tutorials. And “help” content is content based on Q&A’s, engaging with your audience and she describes it as “pull content,” designed for your core audience. She advised staying focused on the video’s purpose as you create. Next, Amy moved into which platforms are best to post and promote your video based on how long it will live on each platform. She said videos last on Facebook 24-72 hours, Instagram 24-48, and YouTube days, months, and years. She explained she made an Adobe “how to” video, posted over a year ago, that now has more than half a million views on YouTube. So think about how the content you’re sharing is going to be used when posting, how long is the videos life? Then Amy described a typical video workflow. She said you could create every video individually like you are led to believe they are, but the best way to pump out great content is to batch your creation, shooting, and editing time. This way, you can set aside time for 3 or 4 videos and get it knocked out in a couple of hours. She explained this process should kind of look like, first, ideation and outline of the video, which takes about 30-60 minutes, filming, 1 hour, editing, 3 or more hours, and uploading and optimizing around 30 minutes. Amy displayed this graphic as a guide on what you should spend the duration of the video talking about. Thank you for reading! If you want to learn more about Amy’s journey and vlog advice check out Amy’s book “How to Vlog like a Boss” here.